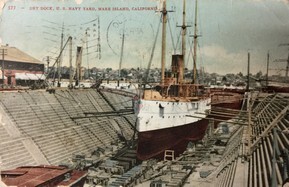 Pictured: Mare Island's Drydock No. 1 was constructed starting in 1878 and completing in 1891 of granite blocks from Placer County. 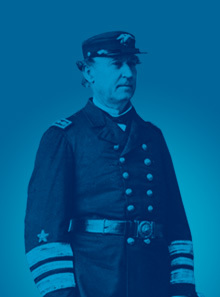 Once commander of the Mare Island Naval Yard, Admiral David Glasgow Farragut (1801 - 1870) is famous in U.S. Navy tradition for his order at the battle of Mobile Bay during the Civil War: "Damn the torpedoes, full speed ahead". THE GENEALOGY SOCIETY OF VALLEJO-BENICIA Genealogy Society of Vallejo was established in October 1997. In 2001 the name was changed to Genealogy Society of Vallejo-Benicia. GSVB is a nonprofit California Association and our monthly newsletter Taproot is sent to our members and exchanged with other societies. We maintain contact and exchange schedules with other societies via e-mail as well. If your research takes you to Vallejo, Benicia, or anywhere nearby, we can help. Our well-stocked reference library is located in the Vallejo Naval and Historical Museum, Second Floor, Room 9 (see: "Our Library" for days and hours). The library is open to both members and the public. Also available is the Vallejo Naval & Historical Museum's reference library.